Over 50% of Mali is located in the Sahara desert. 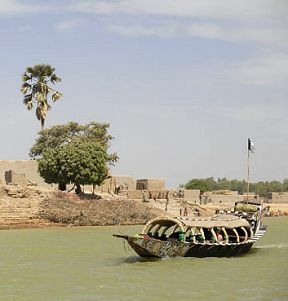 And this is so wise in Mali: you can reach the desert by boat. After the rainy season, when the water level in the river Niger is high, you can sail with the big boat from Koulikoro (north of Bamako) to Gao or board the ship in Segou, Mopti or Timbuktu. As from December you can sail to Timbuktu with a pinasse: a small, slim boat as they make them for centuries, but equipped with an engine! From Timbuktu, in the middle of the desert, you can go any direction in the sand. You can make a day's trip by camel, sleep in the desert (dinner in hotel Mille Etoiles) or make a trip of several days by camel or 4x4 or a combination of both. Who wants to experience one of the most beautiful desert sceneries, has to go to Arawane, about 250 north of Timbuktu. Arawane is a stop for the salt caravans, still transporting salt from the mines in Tawdanit (yet another 400 km north). In Timbuktu the salt is loaded in pinasses and transported to Mopti. An excursion to the salt mines is optional, you need a lot of time and money to visit them. From Timbuktu you can cross the river Niger to visit the homeland of Abou: the Touareg settlement of Aglal, Taganit Keita and then continue to the natural reserve of Gourma. Depending on the season several elephant families cross this region. Via Iniadiatafane you can travel to Hombori and the beautiful rock formations, like 'la main de Fatma'.